floor contact time – this value indicates in milli seconds, how long your foot touches the floor. The shorter the floor contact time, the quicker and more efficient your run is. Wide-range golfe functions: distance to the green, statistics memory, golf stroke width measuring, etc. Whether you're in the city or in the wilderness - The fenix 5 Plus series will help you hold your orientation and stay on track with integrated maps and navigational functions. TopoActive European maps in colour are pre-installed and all maps details are optimised for a clear navigation and position tracking. Joggers and cyclists are best equipped with the popularity routing function. The Garmin Connect™ database is filled with millions of kilometres so that you can follow the best routes while running or cycling. Each Garmin fenix Plus version is equipped with the bright, high resolution, anti-glare, LED backlit Garmin Chroma Display™ in colour, so that in all conditions, even in the full sun, the display is still clear to see. The display screen, in all models of the fenix 5 Plus series, use an extremely durable sapphire lens. Should the wilderness turn mountainous and before you stands a challenging incline, the fenix 5 plus has your back with its innovative ClimbPro widget that send you information about the current and next climbs in real time. You are able to see the grade of the incline, how long the incline is, the diffence in elevation as well as a progress bar of the remaining distance. All fenix 5 Plus watches also uses, together with the reliable GPS- and GLONASS Satellites, the Galileo Satellite navigation system. Which means you stay connected even in bad conditions. Furthermore each watch has a Altimeter, barometer and compass so you're covered in every situation. The built-in altimeter delivers precise altitude measurements, so each climb or descent can be tracked. The electronic 3 axis compass with tilt correction never loses its bearing. Garmin fenix 5 Plus – multi-functional, precise, powerful and waterproof until 100 m.
What makes the fenix 5 Plus series stand out in this field is that its water tight at 10 ATM! Not only suitable for swimming but also for diving. The fenix 5 Plus models are built with accelerator sensors, pulse rate monitor, pedometer and thermometer. These allow for numerous measurements, calulations and evaluations. The Garmin fenix 5 models are able to do a wrist based heart rate measurements (Elevate™ technology), through optical sensors on the back of the watch. Your heart rate is a key factor that shapes your fitness level. Especially during (athletic) activities its important to measure your heart rate at a moments notice so you can change the intensity of your training accordingly. The fenix 5 Plus models trace your daily activities together with your heart rate, so that you become precise readings of how many calories you've burned through the day. Of course the Garmin fenix 5 models are also able to measure your heart rate via chest strap. Pre-installed activity profiles for all your activities, training sessions, adventures, sleep analysis, further performance data (e.g. max. VO2 calculations, calculating your Training workload, calculating your anaerobic and lactate thresholds, recovery advice and more) as well as statements on your training level fill the portfolio of this all-rounder. Experience it all in the new Performance Widget. Inside you'll find all information centralised in one place and have quick access to all important training statistics. So you'll always have your training level in view and become information to optimise your training. Special functions for Jogging, Cycling, Swimming, Skiing, Golf as well as paddle sports including Stand-Up-Paddling and Rowing fill the portfolio perfectly out. Furthermore included in the new fenix 5 Plus series is an integrated activity tracker. Along with the classic activity tracker functions it also monitors your sleep and burnt calories. 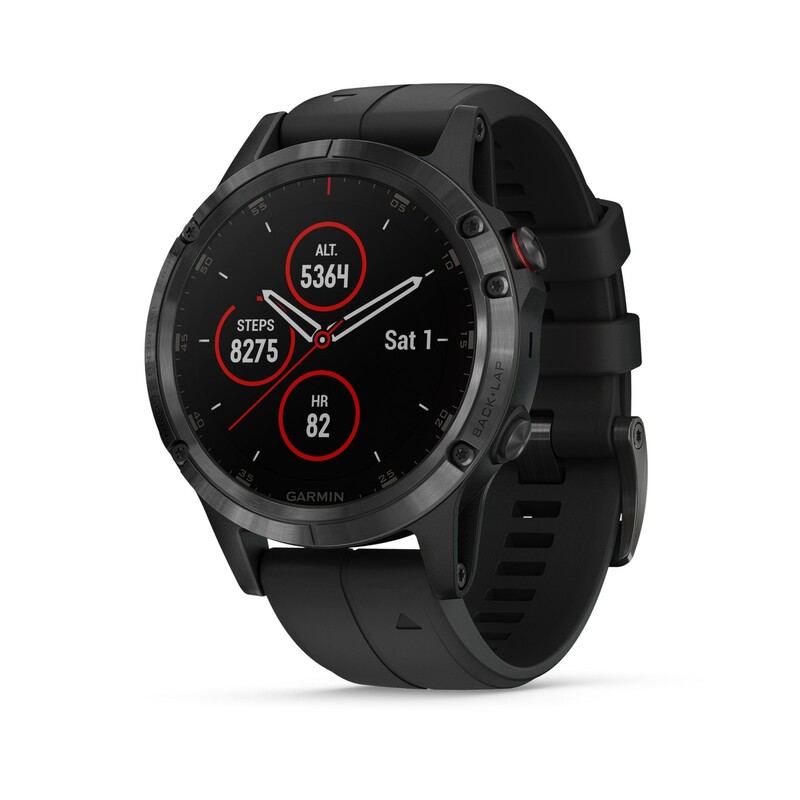 New and unique Pulse OX Technology (only in the fenix 5 X Plus model) calculates your blood oxygen saturation level. This function is especially useful at great altitudes and helps give you a great awareness of your own body. Thanks to the new music player you have your favourite music direct on your wrist. Save up to 500 tracks or 4 GB worth of music direct on your Garmin fenix 5 Plus. You can download your music or syncronise playlists from compatible music streaming services direct onto the watch. Listen to your music without any hassels using bluetooth headphones. Leave your mobile at home when jogging or cycling because all your music is saved directly on the wearable. The fenix 5 Plus keeps up with times and supports Garmin Pay, the smart solution from Garmin, which enables contactless payment. Leave your money and credit cards at home, this function is supported everywhere where a scanner for contactless payment is available. Shopping was never so easy! All models the fenix 5 Plus series support Smart Notifications when your mobile is connected. So that your Emails, SMS's and Alarms pop up on the watch - wherever you are: in the wilderness, on the golf course or just on your break at work. Other online functions such as automatic uploads on the online fitness community Garmin Connect, LiveTrack, GroupTrack (7) and social media using the freely availble Garmin Connect and Garmin Connect Mobile. Customise your fenix watch with free downloads out of the Connect IQ™ shop. Change the display design, add more data fields to the display or download other Apps and Widgets. A variety of QuickFit®armbands in different styles are available to further customise your watch - Premium leather, metal or silicon. So that you can change your style in a blink on an eye to suit your training or activity. Changing the armband is simple and uses no tools. So that your Garmin fenix 5 Plus stays just as unique as you.